The Marine Atlantic Ferry makes trips between Port aux Basques, Newfoundland and North Sydney, Nova Scotia carrying cars and passengers. The MV Caribou Ferry sits high in the water and all you can see when standing near the front of the boat as it pulls into the terminal is the bow. The bow of the Marine Atlantic Ferry, the M/V Caribou as it arrives into Port aux Basques, Newfoundland from North Sydney, Nova Scotia. 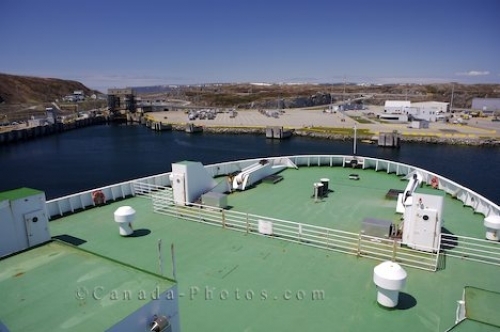 Picture of the bow of the Marine Atlantic Ferry as the boat arrives at Port aux Basques in Newfoundland, Canada.